No one is more disappointed with Brian Williams than Bill O'Reilly. After Williams' tall-tale-telling was exposed, the Fox host went on a tear, saying Williams' lies should have all of us questioning other "distortions" in the liberal media. 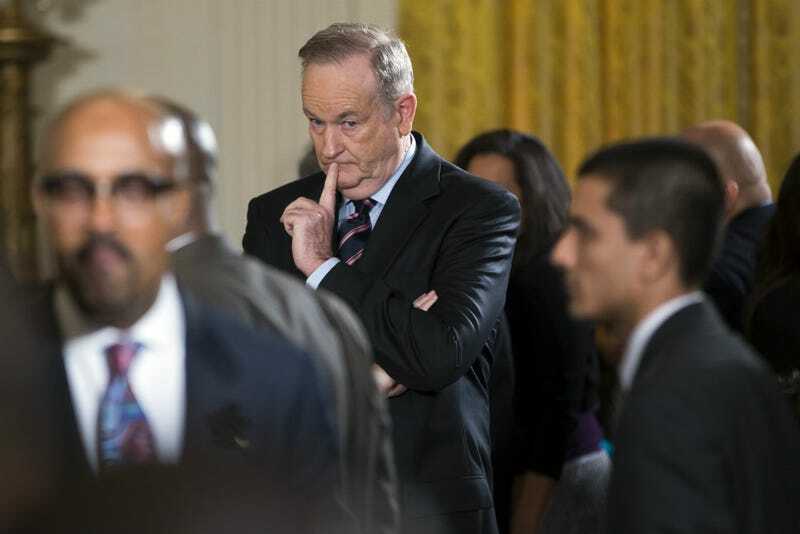 But Mother Jones points out O'Reilly has a few serious whoppers of his own, claiming numerous times to have covered a war in the Falkland Islands when he never got within a thousand miles of the conflict zone. In a story yesterday, Mother Jones' David Corn and Daniel Schulman pointed out that O'Reilly often says that he covered the 1982 war in the Falkland Islands between England and Argentina. He tells stories like this one, claiming to have rescued his photographer as "the army was chasing us:"
"I was in a situation one time in a war zone in Argentina, in the Falklands, where my photographer got run down and hit his head and was bleeding from the ear on the concrete," O'Reilly says. "And I had to make a decision. I dragged him off, but at the same time I'm lookin' around, trying to do my job." As he tells it in his book, O'Reilly, then 32 years old, raced to cover the event: "A major riot ensued and many were killed. I was right in the middle of it and nearly died of a heart attack when a soldier, standing about ten feet away, pointed his automatic weapon directly at my head." A television cameraman was trampled, journalists were banged up, and O'Reilly and others were teargassed. "After a couple of hours of this pandemonium," he recalls, "I managed to make it back to the Sheraton with the best news footage I have ever seen. This was major violence up close and personal, and it was an important international story." The MJ report found numerous other — let's be kind and call them "stretches" — from O'Reilly: he recounts seeing "carnage" in a dangerous province in El Salvador during the country's civil war in his book, and in 2013 he was even more direct: "I've seen soldiers gun down unarmed civilians in Latin America." But the report he filed for CBS News at the time — just before he went to Argentina — had him saying that the military had taken him on a helicopter tour of the area, and that he saw no signs of insurgents, let alone watched them gun anybody down. O'Reilly responded to the Mother Jones report in the most O'Reillyish fashion possible: he told the Washington Post the story was "crap" and David Corn, one of the co-authors, was "a guttersnipe" and "a liar." He told Politico, "I was not on the Falkland Islands and I never said I was. I was in Buenos Aires... In Buenos Aires we were in a combat situation after the Argentines surrendered." He called the story a "hit piece," which seems true, in that it's pretty much a direct hit.